A lot has happened over the last couple weeks. Mother’s Day was an absolutely beautiful day, and started out with breakfast in bed from my wonderful daughter, Punky. She also made me a PowerPoint presentation with some pretty advanced graphics in it spelling out a forest of reasons she loves me and things she loves about me. I decided to treat myself to a bath (a rare treat indeed in my life), and settled myself if with a good book. Within 10 minutes, I was involved in a pitched squirt gun fight with Flintstone (I’m pretty sure the only chance I’ll have to take a bath alone any time soon will be when I’m in labor – and even that is iffy, ha). A few minutes later MacGyver – who seemed to have lost track of Flintstone – came looking for him and stumbled into a very wet ambush. I did get to spend some time reading and drinking tea in the sun out on the deck while the kids and dogs played in the yard. It was a pretty ideal gift. Mother’s Day had been preceded by a tizzy of preparation as I tried to get on top of things at work in preparation for our trip to Portland. In addition to my regular full time job, I am a Detroit Revitalization Fellow which requires an average of 20 extra hours of work per month and this month included a 5 day trip to Portland, OR to study and compare city systems. (I am also a Marine reservist, which also requires a minimum of 20 extra hours per month, but that didn’t really come into play last week). The fancy-pants luxury hotel we stayed in in Portland at least partially made up for the rough time transition, though three 14 hour work days sandwiched between two travel days was a bit draining. Lucky for me, the drain didn’t truly hit me until we got back, and I was able to really enjoy Portland. We went on a truly gorgeous 20+ mile bike ride (and saw a lot of Canadian goslings). We made a couple of trips to Voodoo Doughnuts (which was pretty good but maybe not quite worth the hype; great back story, though). And I ate WAY too much super delicious vegan and ethically sourced food. 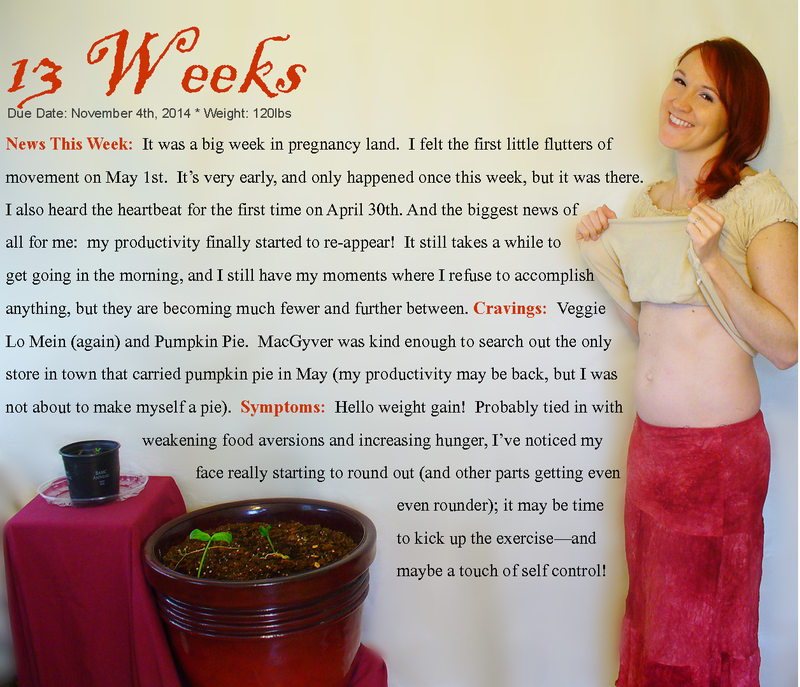 Around the end of week 14 I noticed that even when I don’t stuff myself with way too much truffle roasted broccoli, I have a noticeable baby bump. Something about the way I’m standing in these pictures seems to hide it a little, but it is definitely noticeable throughout the day. Before I know it, my abs will be gone completely. For now, things are rolling right along. I wish I had more time to post here! But all of my jobs are insane right now, and I have a very important side project that I need to be focusing a lot more attention on. More on that (if it works out) later. 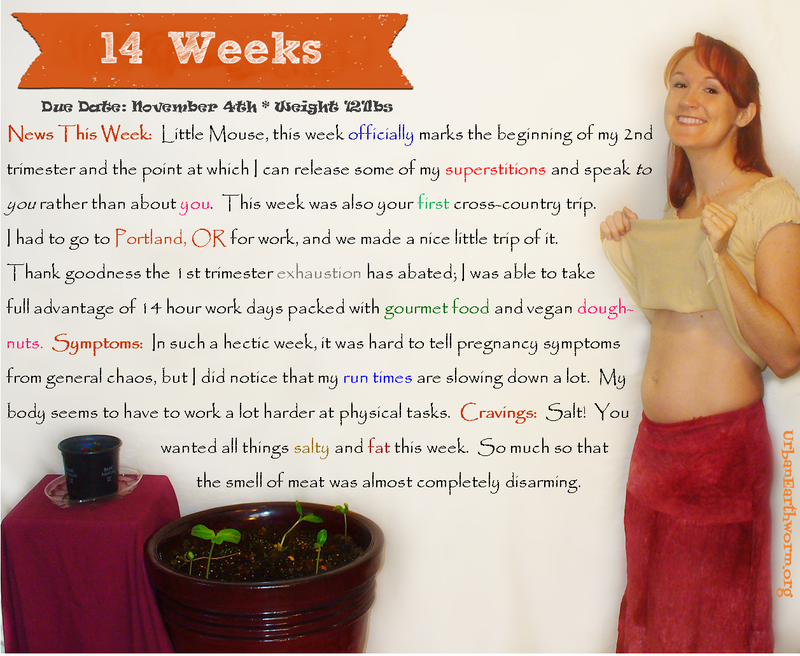 This entry was posted in Check Ups, Ethical Eating, Pregnancy Photography, Pregnancy Symptoms and tagged baby bump, maternity photography, pregnancy memories, second trimester, second trimester pregnancy symptoms, vegan pregnancy cravings. Bookmark the permalink.